Mary Clark, in the Meet My Main Character Blog Tour. Visit her at Literary Eyes. On this particular blog tour, we get to answer questions about My Main Character in a Work In Progress. I find this particularly cool because we get to tag fellow authors who are both published or as yet unpublished, but also scribbling away. To the questions……. 1. What is the name of your character? Is he/she fictional or a historic person? I’m working on more than one book at the moment, and quite liking the idea of publishing more than one at the same time. I have a couple of the Shadow People series on the go, because I’m finding that with such a large amount of books to write, it’s easier and much more fun this way. There are a core of characters who all have greater or lesser parts along the way, but Natalie is obviously the connecting thread. She is absolutely fictional. 2. When and where is the story set? The story takes place on various planets, including Earth and Lapillus, also in various dimensions and space. The timescale is huge (billions of years) as far as the overall story is concerned, but generally is set in the present. 3. What should we know about him/her? From a very ordinary woman, who doesn’t believe in aliens, reincarnation, demons, or any form of otherworldly myth, she finds out along her journey that not only do these things exist, but she is very much a part of all of them. 4. What is the main conflict? What messes up his/her life? Because the first book is already written, it’s already known that her sudden and unforeseen trip to the world of Lapillus, and the discovery of the Nefandus turned her life upside down. The main conflict is fighting off evil creatures that can be both solid and spectral, and finding out what they want. There are quite a few enigmas to be solved, but I don’t want to post any spoilers, so I’ll say that apart from trying to find a way to destroy the demonic Nefandus, a large part of her trip is finding out more about the Zoo worlds of the Gretch, where they come from, and what their agenda is. 5. What is the personal goal of the character? 6. Is there a working title for this novel, and can we read more about it? 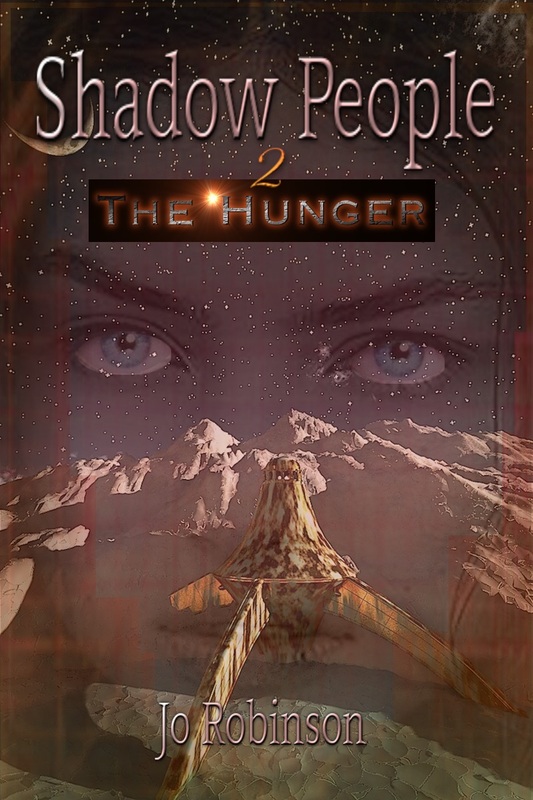 The second book in the Shadow People series is called The Hunger, and already has its cover, designed by the multi-talented and most cool Chris Graham. 7. When can we expect the book to be published? In a couple of months, if I decide to publish more than one at a time, or sooner if I don’t. I’ve tagged four fabulous authors – all inspirations to me, who if they take on this challenge will post their own My Main Character blogs on the 26th May. Wonderful friend who does so, so much, and all of it so well. Brilliant author, expert on health and wellbeing, radio host, and all around lovely lady. The world is most definitely a nicer and very much more interesting place with her in it. Ailsa is an inspiration to me, and I love her indomitable spirit, and down to earth character. She laughs in the face of adversity, and gets us all laughing with her. She is a hugely popular author, because she’s so good at what she does. I can’t wait to read Sherri’s upcoming book! I look forward to all of her blog posts, where her warmth, affection, and seriously powerful writer’s muscle are plain to see. She’s another who I am honoured to call friend. Another book I’m eagerly anticipating, again from another wonderful lady who is my friend. Warm, witty, and with a seriously large allocation of genius, she definitely is an author to keep your eyeball on. This entry was posted in Uncategorized, Writing & Indie Thoughts and tagged Meet My Main Character Blog Tour. Monday Funnies – Another Two Ronnies Treat – FORK HANDLES! wow – amazing – you deserve to shine! way to go! Love the idea of Zoo Worlds. The fact that there’s more than one makes it so much more intriguing. I hate to admit how interesting they side. Reminds me of a character from Superman who collects rare, one-of-a-kind creatures for his personal zoo. I have been tagged by the wonderful Jo Robinson to partake in the meet the main character blog tour. I am delighted to accept the challenge and will proceed with next week. I have a few authors in mind to tag – great authors established and those just starting out. Thanks Jo – so sorry not near enough to enjoy a glass or two. Back to the beginning of the story. Congrats on your recognition! Thanks for taking advantage of the opportunity, and sharing your work in progress. I’m really glad to read more about what you had mentioned here before. Lapillus makes me think of the beautiful watery blue color of a gemstone. I like how you describe Natalie as being part of things that she didn’t believe in. I like your element of finding out what evil creatures want. “To accept her destiny.” Wow. Shades of Isak Dinesen. And I love Chris Graham’s cover. Thanks for being part of the Tour.